From debut author Sally Kilpatrick comes a hopeful tale of love and redemption in a quiet Southern town where a lost soul finds her way with the help of an unlikely circle of friends. . .
Life has dealt Beulah Land a tough hand to play, least of all being named after a hymn. A teenage pregnancy estranged her from her family, and a tragedy caused her to lose what little faith remained. The wayward daughter of a Baptist deacon, she spends her nights playing the piano at The Fountain, a honky-tonk located just across the road from County Line Methodist. But when she learns that a dear friend's dying wish is for her to take over as the church's piano player, she realizes it may be time to face the music. . .
Beulah butts heads with Luke Daniels, the new pastor at County Line, who is determined to cling to tradition even though he needs to attract more congregants to the aging church. But the choir also isn't enthusiastic about Beulah's contemporary take on the old songs and refuse to perform. Undaunted, Beulah assembles a ragtag group of patrons from The Fountain to form the Happy Hour Choir. And as the unexpected gig helps her let go of her painful past--and accept the love she didn't think she deserved--she just may be able to prove to Luke that she can toe the line between sinner and saint. . . 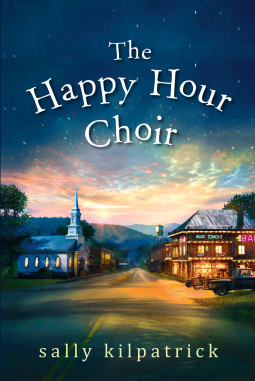 The Happy Hour Choir is a fabulous read, it has a strong plot and well rounded characters. Beulah Land is a pianist, the best pianist in town according to her old piano teacher Ginger - who took her in when her parents kicked her out after discovering Beulah was pregnant when she was 16. She plays piano at The Fountain, a honky tonk bar across the road from County Line Methodist church where a new parson has just come into residence. Pastor Luke Daniels is new in town, and when he hears the music coming from the honky tonk bar across the road from his new home he just has to go and investigate - enjoyable, until the piano playing hussy started playing a hymn that would have been better kept in church (in his opinion) than in a bar. And he isnt shy about telling the pianist so. Ginger is dying. The doctors say she has little time left and could 'go' at any time. Its her dearest wish for Beulah to take over playing the piano in County Line Methodist once she has departed - but she wants to see her in the role before then. And, she hopes the spark that she senses between the feuding Beulah and Luke can be fanned into a flame. Tiffany is pregnant and only 19. Who is the father of her baby? She's not telling anyone a thing. When Beulah and Ginger step in to remove her from an abusive home situation she flourishes under their care - Ginger hopes she lives long enough to see Tiffany's baby born. I really enjoyed this story with its laugh out loud moments, the indignation of the church members is priceless and I can just imagine the staid matrons tittering over the fact that the "fallen one" has not only entered their congregation, but is playing the piano (after also playing the instrument the night before in a Honky Tonk the night before, no less) - and who has caught the eye of their new pastor! Shameful, thats what it is! A truly enjoyable read. Do Beulah and Luke get past their differences? Does Ginger live to see Tiffany's baby? Do the people in the church ever accept Beulah and her ragtag choir?